SARAH’S KEY starts off in the most charming way: two children, a boy and a girl are playing, tickling each other and just enjoying being children. Their play is interrupted by a knock at the door. Grim faced men have come to take the children and their parents away. The girl, Sarah (Mélusine Mayance) desperately hides her brother in a secret room. And that one action defines the rest of Sarah’s unhappy life. And unhappy is an understatement. Because Sarah and her family are Parisian Jews living in France in 1942 and they are being incarcerated not by the Germans but by their own people, The French government. The Parisian Jews are held in a stadium and in scenes that reminded me disturbingly of New Orleans in the aftermath of our own holocaust called Katrina, Sarah and her family are tortured by not only wondering what has become of the hidden boy but by the inhuman treatment they are forced to endure. And that’s even before they are transferred to concentration camps where the real horror begins. While Sarah’s story plays out in World War II, there’s a second story to be followed. This one takes place today and involves a journalist, Julia Jarmond. (Kristin Scott Thomas) She moves into the house Sarah used to live in along with her French husband (Michel Duchaussoy) Julia is already working on a story about the deportation of Jews during 1942 and during her research uncovers Sarah’s story and a surprising connection her husband has to the history of the house and to Sarah’s story. It’s a story that Julia becomes obsessed with, pursuing the sad tale of Sarah’s life across Europe and to America where she learns Sarah’s eventual fate. Is Julia pursing this story to escape her own martial troubles and the sudden realization that she is pregnant and that she may not be ready to be a middle-aged mother? Is she outraged by the injustice that the French did to their own people? Is she determined to use Sarah’s story as an example of the French complicity in Nazi atrocities and their persecution of the Jews in Europe? I wish I could tell you but I’m not sure I know. 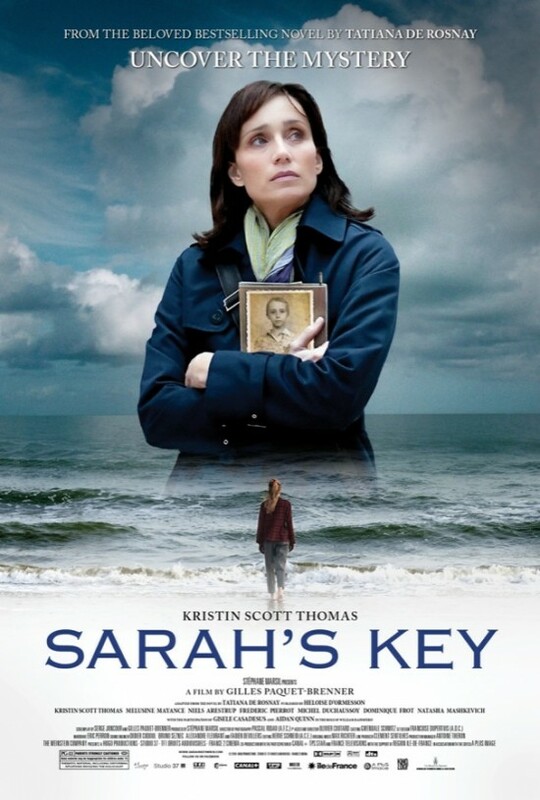 SARAH’S KEY is unlike most movies about The Holocaust and World War II and the way the story is told is one of those elements. This isn’t your typical summer movie so if you need explosions or somebody getting shot, stabbed or slugged every five minutes; this isn’t your kind of movie. The violence is brutally honest and realistic. The emotions displayed are not done in bombastic speeches but in heartfelt conversations where the participants can barely express how deep their pain is. And that’s what a lot of SARAH’S KEY is about: pain, loss, secrets told and secrets kept. And more than anything else, it’s about the choices people make and how even those choices that are made with the best of intentions can have repercussions almost too horrible to bear. Kristin Scott Thomas carries most of the movie on her back and she does it very well. Her being an American living in France and married to a Frenchmen gives her character a unique perspective on the situation as she finds out more and more about Sarah through the girl’s diaries and the recollection of people who knew her, including her son William (Aidan Quinn) who as it turns out, really didn’t know his mother at all. So should you see SARAH’S KEY? I certainly think so. It’s no runaway summer action blockbuster. But it is a rewarding movie in terms of the subject matter and how it deals intelligently and in a mature manner with an event during World War II that most people don’t even know happened. I sure didn’t but I’m glad that SARAH’S KEY explored it. This isn’t a feel good movie and isn’t one that you want to watch on a date night but it is well made with solid, emotional performances. If you’re somebody who wonders why they don’t make movies for adults anymore, this is the one they made for you.